Transferring the state of an information carrier between two parties is an essential primitive in both classical and quantum communication and information processing. Quantum teleportation  describes the concept of transferring an unknown quantum state from a sender to a physically separated receiver without transmitting the physical carrier of information itself. To do so, teleportation makes use of the non-local correlations provided by an entangled pair shared between the sender and the receiver and the exchange of classical information. In our recent publication  we report the first teleportation of information in a solid state system. We use a chip-based superconducting circuit architecture [3, 4] (Fig. 1) with three superconducting transmon qubits  and three superconducting coplanar waveguide resonators  which serve as a quantum bus [7, 8] and allow to perform qubit state readout [9, 10]. We have realized the full deterministic quantum teleportation protocol using quantum-limited parametric amplifiers  for single-shot readout, a crossed quantum bus technology and flexible real-time digital electronics. Figure 1: In our chip-based superconducting circuit three qubits are coupled to three resonators to realize deterministic quantum teleportation. The success of the teleportation protocol in every instance with unit fidelity is counterintuitive from a classical point of view . The receiver’s quantum bit (qubit) does not interact with any other qubit after it has been entangled with one of two qubits in the sender’s possession. The input state (|ψin>) is prepared at a later time at the sender. The classical information sent by the sender is not sufficient to recreate |ψin> perfectly at the receiver. Indeed, assuming no entanglement between sender and receiver one can replicate the sender’s state at best with a process fidelity of 1/2. To always recover the original state |ψin> the sender performs a measurement in the basis of the Bell states, which projects the two qubits in the sender’s possession randomly onto one of the four Bell states. As a consequence the receiver’s qubit is projected instantaneously into a state related to |ψin> without ever having interacted with the sender’s qubit. The receiver’s qubit only differs from the input state by a single-qubit rotation which depends on the four possible measurement results. 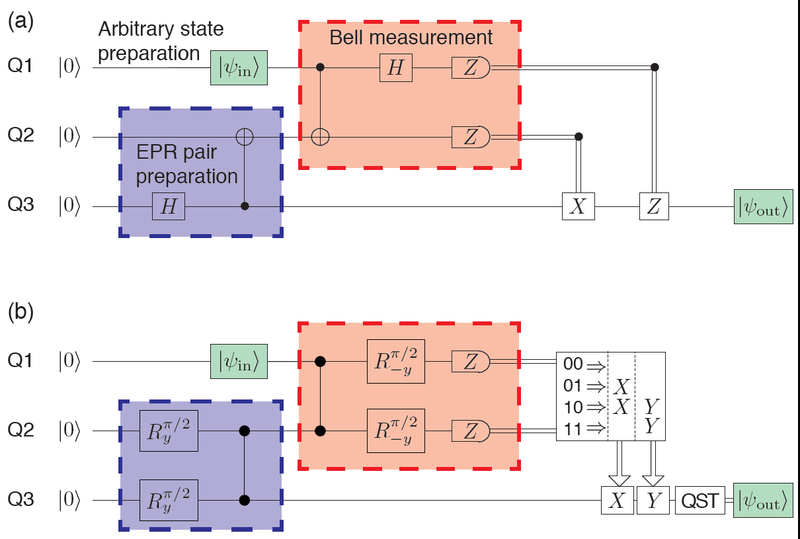 In the final step, the sender communicates the Bell measurement result as two bits of classical information via a classical channel and therefore the receiver can always obtain the original input state |ψin>. This final step is frequently referred to as feed-forward. Figure 2: a) Standard protocol of quantum teleportation. The protocol starts with the preparation of a Bell state between Q2 and Q3 (blue box) followed by the preparation of an arbitrary state |ψin> (green box) and a Bell state measurement of Q1 and Q2 (red box). The classical information extracted by the measurement of Q1 and Q2 is transferred to the receiver to perform local gates conditioned on the measurement outcomes. At the end of the protocol Q3 is in a state |ψout> which ideally is identical to |ψin> (also colored in green). Here, H is the Hadamard gate, X and Z are Pauli matrices σx and σz, respectively. The cnot-gate is represented by a vertical line between the control qubit (•) and the target qubit (⊕). b) The protocol implemented in the experiment presented here uses controlled-phase gates indicated by vertical lines between the relevant qubits (•), and single qubit rotations Rθ±y of angle θ about the ±y-axis. To finalize the teleportation we either post-select on any single one of the four measurement outcomes (00, 01, 10 and 11) acquired in a single shot, or we deterministically use all four outcomes, which we then may use to implement feed-forward. 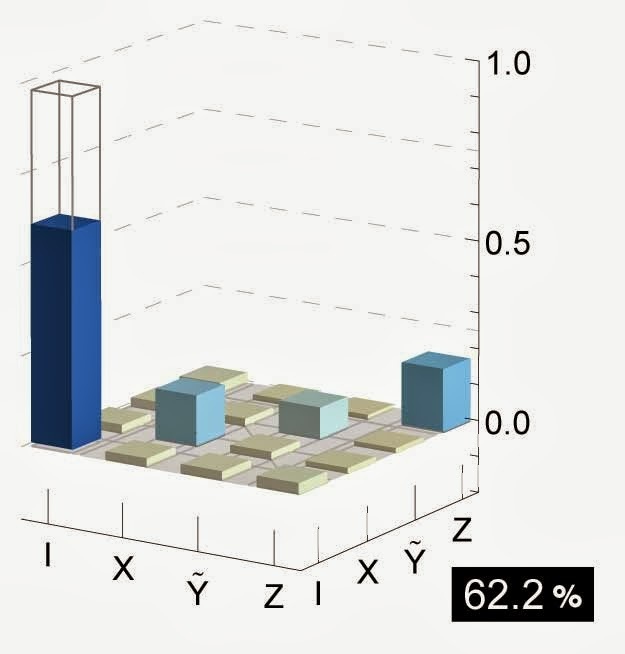 The feed-forward operators Rπx and Rπy are applied to Q3 conditioned on the four measurement outcomes according to the table presented in the framed box. Our implementation of the protocol (Fig. 2b) uses single qubit rotations and controlled-phase gates [13, 14] and is equivalent to the original protocol shown in Fig. 2a. The teleportation process succeeds with order unit probability for any input state, as we reliably prepare entangled states as a resource and are able to distinguish all four maximally entangled Bell states in a single measurement. Figure 3: The solid bars show the experimentally obtained process matrix describing the state transfer from the sender to the receiver. The ideal process matrix, which is the identity operation, is shown in wire frames. To identify simultaneously the four outcomes of the Bell-state measurement in a deterministic way we use two-qubit single-shot read-out [15, 16] for which we achieve a success probability of (81.8±0.5) %. In the teleportation protocol we analyze the Bell-state measurement in real time by using fast electronics based on a field programmable gate array (FPGA) and realize the feed-forward step in about 500 ns. We have achieved an average process fidelity of (62.2±0.3) % for the full quantum teleportation algorithm, which is clearly above the classical threshold (Fig. 3). We have demonstrated teleportation at a rate of 10,000 quantum bits per second between two macroscopic systems separated by 6 mm. 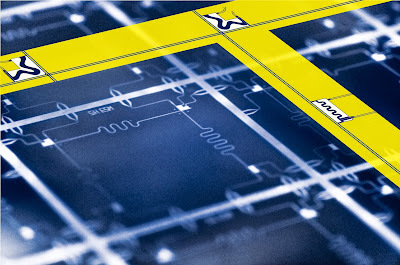 The low transmission loss of superconducting waveguides is likely to enable the range of this and other schemes to be extended to significantly larger distances, enabling tests of non-locality and the realization of elements for quantum communication at microwave frequencies. The demonstrated feed-forward may also find application in error correction schemes. Charles H. Bennett, Gilles Brassard, Claude Crépeau, Richard Jozsa, Asher Peres, and William K. Wootters. "Teleporting an unknown quantum state via dual classical and Einstein-Podolsky-Rosen channels". Physical Review Letters, 70, 1895 (1993). Abstract. L. Steffen, Y. Salathe, M. Oppliger, P. Kurpiers, M. Baur, C. Lang, C. Eichler, G. Puebla-Hellmann, A. Fedorov, and A. Wallraff. "Deterministic quantum teleportation with feed-forward in a solid state system". Nature, 500, 319 (2013). Abstract. A. Wallraff, D. I. Schuster, A. Blais, L. Frunzio, R.-S. Huang, J. Majer, S. Kumar, S. M. Girvin, and R. J. Schoelkopf. "Strong coupling of a single photon to a superconducting qubit using circuit quantum electrodynamics". Nature, 431, 162 (2004). Abstract. F. Helmer, M. Mariantoni, A. G. Fowler, J. von Delft, E. Solano, and F. Marquardt. "Cavity grid for scalable quantum computation with superconducting circuits". Europhysics Letters, 85, 50007 (2009). Abstract. Jens Koch, Terri M. Yu, Jay Gambetta, A. A. Houck, D. I. Schuster, J. Majer, Alexandre Blais, M. H. Devoret, S. M. Girvin, and R. J. Schoelkopf. "Charge-insensitive qubit design derived from the Cooper pair box". Physical Review A, 76, 042319 (2007). Abstract. 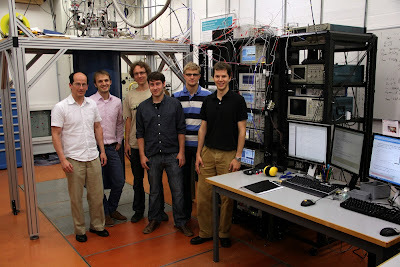 M. Göppl, A. Fragner, M. Baur, R. Bianchetti, S. Filipp, J. M. Fink, P. J. Leek, G. Puebla, L. Steffen, and A. Wallraff. "Coplanar waveguide resonators for circuit quantum electrodynamics". Journal of Applied Physics, 104, 113904 (2008). Abstract. J. Majer, J. M. Chow, J. M. Gambetta, J. Koch, B. R. Johnson, J. A. Schreier, L. Frunzio, D. I. Schuster, A. A. Houck, A. Wallraff, A. Blais, M. H. Devoret, S. M. Girvin, and R. J. Schoelkopf. "Coupling superconducting qubits via a cavity bus". Nature, 449, 443 (2007). Abstract. Mika A. Sillanpää, Jae I. Park, Raymond W. Simmonds. "Coherent quantum state storage and transfer between two phase qubits via a resonant cavity". Nature, 449, 438 (2007). Abstract. R. Bianchetti, S. Filipp, M. Baur, J. M. Fink, M. Göppl, P. J. Leek, L. Steffen, A. Blais, and A. Wallraff. "Dynamics of dispersive single-qubit readout in circuit quantum electrodynamics". Physical Review A, 80, 043840 (2009). Abstract. Bernard Yurke and Eyal Buks. "Performance of cavity-parametric amplifiers, employing Kerr nonlinearites, in the presence of two-photon loss". Journal of Lightwave Technology, 24, 5054 (2006). Abstract. S. Massar and S. Popescu. "Optimal extraction of information from finite quantum ensembles". Physical Review Letters, 74, 1259 (1995). Abstract. Frederick W. Strauch, Philip R. Johnson, Alex J. Dragt, C. J. Lobb, J. R. Anderson, and F. C. Wellstood. "Quantum logic gates for coupled superconducting phase qubits". Physical Review Letter, 91, 167005 (2003). Abstract. L. DiCarlo, J. M. Chow, J. M. Gambetta, Lev S. Bishop, B. R. Johnson, D. I. Schuster, J. Majer, A. Blais, L. Frunzio, S. M. Girvin, and R. J. Schoelkopf. "Demonstration of two-qubit algorithms with a superconducting quantum processor". Nature, 460, 240 (2009). Abstract. François Mallet, Florian R. Ong, Agustin Palacios-Laloy, François Nguyen, Patrice Bertet, Denis Vion & Daniel Esteve. "Single-shot qubit readout in circuit quantum electrodynamics". Nature Physics, 5, 79 (2009). Abstract. R. Vijay, D. H. Slichter, and I. Siddiqi. "Observation of quantum jumps in a superconducting artificial atom". Physical Review Letters, 106, 110502 (2011). Abstract.